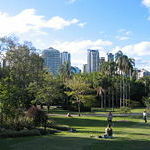 Brisbane City Council's Active Parks program offers fun activities in more than 50 local parks across the city, many of them on the weekend. And most of them are even free of charge or at low cost. There is a great variety of activities to choose from, such as martial arts, Nordic walking, kayaking and even belly dancing with live drumming. And you don't need to worry about a babysitter because there are many classes suitable for kids such as recreational tree climbing and parents and toddler sports. Even the family dog can take part and stay healthy as doggy sports classes or the doggy treasure hunt are available as well. Active Parks also offers many arts, craft and gardening activities. The program changes on a regular basis and can be downloaded on the city council's homepage. Bookings are essential for many activities.